It didn’t take the exciting Proteas quick long to make his mark again following a knee injury. The Thel was a tactical high-energy laser developed by the US and Israeli militaries in the early 2000s and used to destroy incoming artillery. While its bulkiness led to it being discontinued in 2005, South African cricket’s own version of a tactical high-energy laser in the form of Lungi Ngidi is sure to be around for a lot longer. The 22-year-old has been forced to work hard on his conditioning and athleticism. He suffered stress fractures in 2014, that forced him out of the famous U19 World Cup winning campaign, and again in 2017, but the knee injury he has just returned from was due to a fielding mishap in Australia in November last year. 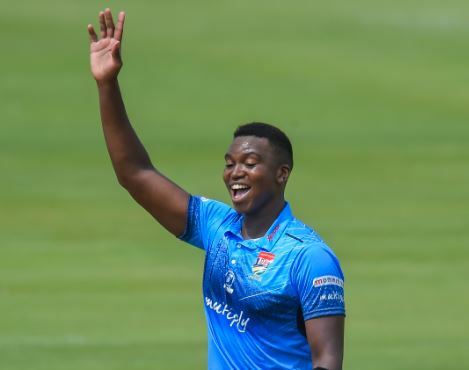 Ngidi returned to competitive action last weekend, opening the bowling for the Titans and taking the first two wickets as they cruised to a massive victory over the Knights in the domestic One-day Cup. While it was an encouraging first outing back, Ngidi is not that interested in the short-term but is after long-term success for both his franchise and South Africa. With just five one-day-internationals left for the Proteas before the World Cup, there is selection for that squad to take care of, but the towering Hilton College product is not feeling pressure. “The World Cup is not the be-all and end-all, I would love to play in it this year but I’m not feeling any pressure because hopefully I will have a long career. “I’m happy to be back on the field, the main thing is to get game time. It was good to finally get out there and test the knee,” he said. There was certainly an air of expectancy at SuperSport Park as Ngidi took the new ball to bowl the second over. With a haze over Centurion and humidity in the air, it seemed a good time to be bowling, shortly after 10am, and Ngidi needed only seven deliveries to strike, having Grant Mokoena caught behind for a single. But the University of Pretoria law student was not entirely satisfied with his opening salvo. “I was nervous, but that’s only natural and … I knew I had put the work in. “After the first over, I thought ‘I’m back’. But I put a lot of pressure on myself. I have high standards and I wasn’t particularly happy with my first wicket – that ball was short and wide. “My rhythm wasn’t quite there so my pace wasn’t great. “I was really focusing on hitting my areas but I bowled a few loose balls that were not dispatched and, if I’m honest in terms of international level, my first few overs were not up to standard. “The second half was much better. My change-ups and yorkers found the mark and I was happy with that,” Ngidi said after his first five overs netted him 2/14 and then bowling two overs for 10 runs in the 32nd and 34th overs, before conceding just 11 runs in two overs at the death. Apart from a hint of cramp and some tiredness, Ngidi suffered no ill effects from his nine overs. Making the World Cup squad is a mountain to climb for some, but probably not for Ngidi.